In large bowl whisk together hot water and cocoa until smooth, no lumps. Set aside. In another bowl sift flour, salt, baking soda together. In bowl fit for an electric mixer, mix in cream, sugar and eggs together for 3 minutes. Stir in sour cream, once combined add vegetable oil. Mix until ingredients combine. Then stir in grated zucchini to flour mixture, give it a good stir to coat all zucchini in flour. Then add the flour zucchini mixture to sugar sour cream mixture. Stir until combined. Stir in cocoa mixture and mix until smooth. Then fill each cupcake liner with 1/4 cup full of chocolate zucchini cake mixture. Bake 20 to 25 minutes or until toothpick inserted in middle comes out clean. 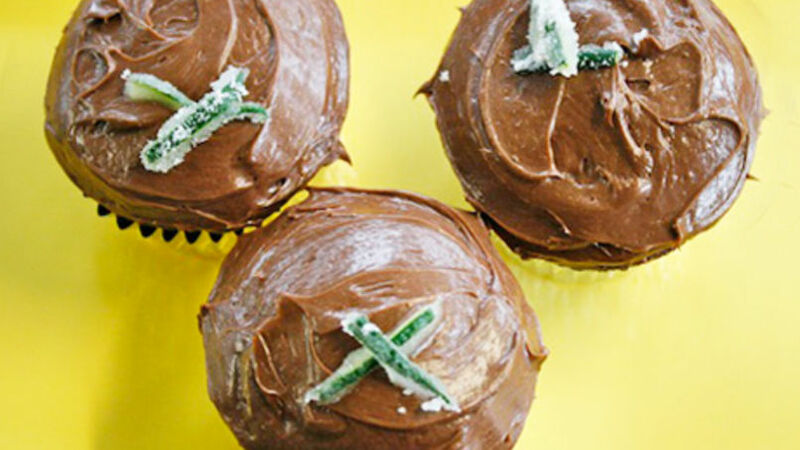 Roll a few strands of grated zucchini in sugar and add to the top of each cupcake for a nice decorative touch. It was 1999, and I was roaming the streets of Paris, France. Literally getting lost without a care in the world. I found myself on Ave des Champs-Elysees shopping my way through town. I turned a corner or two and found a bakery lined street where everything smelled so exquisite. I ran like a bolt of lightning to the nearest bread store and flung open the door. A waft of freshly baked cakes and cookies smacked me right in the face…. I inhaled deeply. My eyes scanned the display case and I salivated as my mind raced and tried to imagine what each dessert might taste like. Then there it was sitting in all its glory, a zucchini chocolate cake. I couldn't understand it, my mouth had never explored that flavor combination but it totally made sense…Add chocolate to zucchini bread and you have a marriage of two sweets that only Parisians could dream up. I ordered a slice right away, and the rest is history. I now use this combo as a common standard in my house and have introduced it to many of my family members and friends. Enjoy!